 A. MASSON, « Offering Magazines on the Southern Bank of the Sacred Lake in Karnak: The Oriental Complex of the Twenty-fifth-Twenty-sixth Dynasty», dans E. Pischikova, J. Budka, K. Griffin (éd. ), Thebes in the First Millenium B.C., Cambridge, 2014, p. 587-602 1 citation(s). Ce document est librement consultable à partir d’un site extérieur : http://www.academia.edu/5972801/. A. MASSON, M. MILLET, « Foundation Deposits of Tuthmosis IV at Karnak », EA 23, 2003, p. 17-19 1 citation(s). 4 986 536 visites - 2 053 visite(s) aujourd’hui - 4 connecte(s).